The weather may let you down, but your wardrobe shouldn't. MarlaWynne brings you coveted staples that coordinate in chic ways so you can dress in style, effortlessly. I didn't discover this until all that was left in my size was red and blush. I absolutely LOVE this Turtleneck. I would have loved to have had them all in my size. I would love a turquoise one. Marla Wynne is my favorite HSN designer!! She is a genius! I love butterfly tees as they look great on me and cover my worse part, my stomach area! Fits as advertised. Comfortable and stylish. Would purchase again. This is an exceptional piece. 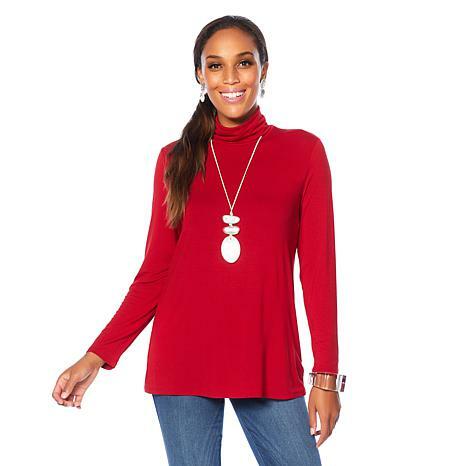 The turtleneck is not too tight and the butterfly cut is great for apple and pear shapes.Make more colors and don't forget about the pear shapes. we need to keep the 7 includes from the body oversizing looks best on us. Thanks. This is my first purchase of Marla Wynne, and I am now a Fan of her designs. I think she gives great thought of the shape of women when choosing fabrics for her designs.This turtleneck is awesome, washes great. I hang my clothes to dry, so I don't know how it drys in the dryer?This fabric is easy to layer over.